Four new stations have opened on the Guangfo Line of the Guangzhou Metro. 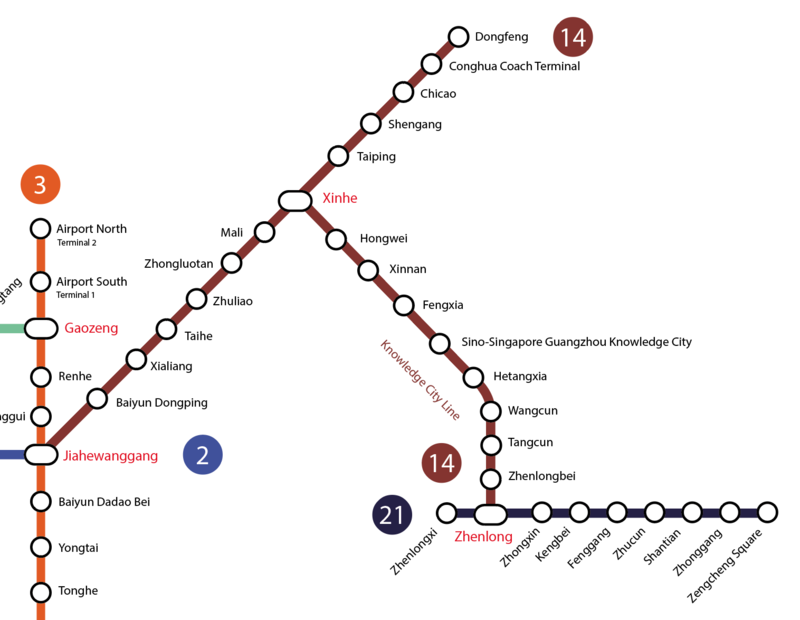 The Guangzhou Line connects Guangzhou with nearby Foshan, and the new stations improve connectivity to the line, with a new interchange station with Line 8 at Shayuan. This entry was posted in guangzhou, newlines on January 3, 2016 by matt. Guangzhou Metro Line 6 has opened to passengers. The new line runs from Xunfenggang in Baiyun District, through Liwan and Yuexiu, and terminates at Changban in Tianhe District. There are new interchanges with Line 5 at Tanwei, Line 1 at Huangsha, Line 2 at Haizhu Square, Line 1 at Dongshankou, and Line 3 at Yantang and Tianhe Coach Terminal. Updates to our online map, iOS and Android apps will be available soon! This entry was posted in guangzhou, newlines on December 28, 2013 by matt. We’re pleased to announce that Explore Guangzhou Metro map is now available free on iPhone! Explore Guangzhou 9.0 includes an up to date metro map, route-planner with times and prices for journeys, integrated Apple/Google/Offline street maps and much more! The app will now show occasional ads. If you’ve previously bought Explore Guangzhou you won’t see ads, and if you’re new to Explore Guangzhou you can try it out for free, or disable ads with a one-off payment of $0.99. We’ve written an FAQ about ads if you have any questions. This entry was posted in guangzhou, iPhone on April 13, 2013 by matt. Explore Beijing and Explore Guangzhou have also been updated to version 7, they are now available on the App Store! Version 7 includes step-by-step routeplanning. Check out some screenshots from the latest versions, then download Explore Beijing or Explore Guangzhou today! This entry was posted in beijing, guangzhou, iPhone on September 10, 2012 by matt.